We're in tick central here in CT.... I've done some very rigorous scientific peer-reviewed studies on my own private stock of captive ticks. If you treat clothing/gear with Permethrin it'll last days/weeks although I still spray it every time. I have great concern with synthetic pesticides...and very allergic to a lot of things. I've used neem oil to deter spiders with moderate success, have no access to ticks right now. Have a couple of repellent mixes of natural oils (citronella, peppermint, lemon, eucalyptus, geranium, some others) - don't know if these really work, though. Asian Longhorned Tick can reproduce without mating. Yikes! Reading that, I had a "IT RUBS THE LOTION ON ITS SKIN OR ELSE IT GETS THE HOSE AGAIN!!" image for a moment. Re-reading, all's good. We and our local ER clinic have seen several clinical Lyme (fever, joint effusion) cases in dogs already this year. Check yourselves and your canine companions. A friend of mine here was scolding me, that I should not use the term Lyme, because I could have any kind of spirochete; especially since I got it from the Lone-Star Tick, who knows what it is! I told him the term Lyme is used very loosely, and at the same time can refer specifically to Borrelia burgdorferi. That the treatments are all the same for the different tick spirochetes, yet any one spirochete can give you unlimited dissimilar symptoms! So what the hell difference does it make? None, that is why people just refer to everything as Lyme. Any spirochete can give you any disease and any herb tick treatment can kill any spirochete. They all will eat you alive if you do nothing ... well maybe not all ... some stay in your joints or else if you are unlucky in your brain. Here is a video that proves my point, that is that 1.) that this doctor by default uses the term Lyme to refer to any number of tick born problems and 2.) this is born out again by the fact that he admits that he contracted it from a horse fly. (BTW, I think you can catch Lyme from horseflies, but not typically.) 3.) Then he turns around and uses the term to refer specifically to Borrelia burgdorferi. How am I doing now? I feel okay now, but I suspect I have a little brain fog, not sure. I talk too much, more then normal ... perhaps. Starting today I am going for 4 times a day and once at night. I have to mimic the antibiotic and get it flowing continuously through my blood. Need to take three droppers full 3 times a day and more rather then just drops three times a day. And that along with the dirt. I worked on the computer 1/2 the day and yesterday I worked all day with no symptoms I could detect. I make my own tincture now for Japanese Knotweed, found a better one on the market, and found better dirt. I used the stump, most people throw that part out. I had to beat it with a hammer to make it potentially worthwhile. Next I will make the powder as soon as I figure out how. What fun I am having today! Got to keep it interesting. And, I found out a secret protocol. Blend up the dirt and then mix it with apples and an orange and it tastes good instead of bad like dirt where I dread it and gag. So exciting, it's like doing a big wall! Eshh .. so irrational ... I must have Lyme? Any spirochete can give you any disease and any herb tick treatment can kill any spirochete. I am going to see this guy in Virginia, because I agree that 1/2 (if not all of the problem?) is with you not with Lyme. The Guy Has A Book! One of the best first steps is to see a real neurologist who believes in chronic Lyme. I can get you a few names in CT. They don't take insurance though and are extremely expensive. The first thing they'll do is a complete workup with like 30 vials of blood being sent to different labs. You're right in that Lyme might not be your only issue or your problem at all as there is no valid direct test for it. Consider reading this again; it's remedial but relevant, IMO. Whether or not a rickettsial infection was the precipitating event, everything you continue to describe suggests inflammation, which at this point may very well be occurring in the absence of infectious etiology. Or from less-than-rigorous sterility from home arthrocentesis for that matter. You would do well to take fear up on his offer and see a specialist in neurology or rheumatology; put the faith, time, and money described here chasing alterative therapies into a thorough diagnostic workup and treatment regimen that you 1. follow, 2. objectively assess, and 3. document. Not stop after 3 days because you do, or don't, feel better in one body part or symptom. Or you miss the taste of dirt. And while it's true that some health care professionals continue to be oddly intransigent to acceptance of the extent of arthropod-vector disease, take a hard look in whom you're entrusting your current care. Yeshhhh ... did you guys read https://www.chronic-lyme-disease-solutions.com/lyme-disease-support.html ??? I made an appointment with that guy for 10/10/2019 $250.00 and he gives you a tailored protocol to get your immune system working to deal with Lyme so as to beat it. You think he is lacking in something? Not sure where we are going here in light of my previous post because you both suggested those other guys in Connecticut. The lab rat thinks he is on to something big. A friend of mine did not understand the posts that have to do with what grade I am climbing at this day or that day. The reason why I post that kind of information is because the chronic guys on the antibiotics just lay on the floor all day, they can do nothing. But to the point, I think it is important to know where I am physically on some kind of scale, that is the reason why we observe lab rats. So far I am 100%, except for my middle finger hurt for 3/4 of the day and I am coming out of a slight brain fog. I went to the gym and did three 5.10s, and felt better after drinking more water and doing the breathing exercises. If I had a real problem it would be that I can not get on my feet and my joints were all swollen and my brain did not work, same as it did before. I know what bad is. I am not there today and I can only get better as time goes on. The real problem and fear I have now is that how am I supposed to know when I have killed all the bugs? If I have not killed them all and stop it takes 10 days to get back to normal and then I suppose another week or two to lock it in. And, I took the big blood test, I have a lot of nickel and aluminum, so that lab I mentioned before prescribed a lot of pills that I had slacked off on. Now I am taking them again seeing the necessity of foremost optimizing my immune system. The guy is a complete charlatan. Take Fear's advice above. Who had you take a big blood test? The issue is getting a better handle on exactly where all your problems might arise from. It very well could be Lyme or Lyme in conjunction with 5 other pathogens and an auto-immune condition. We threw antibiotics against the wall too for 2 years before finding the right neurologist in Orange, CT. Diagnosing something like this is a long extensive process based on a lot of repeated blood work and symptomatic analysis. It's an iterative thing as there is likely no single thing you can do to alleviate your condition. So if the Lyme literate doctor thinks Lyme is the primary issue then you try antibiotic X for 4 weeks and reassess... One known thing at a time. Finding a doctor to answer a questions was impossible on a Friday night, so over the weekend I decided to do it myself. All those guys wanted from me was my money. Looking back I suppose I could have tried that antibiotics and would suggest them to people when they first get Lyme. But those guys what to see blood tests to find out if you have it, when in the only sure way to tell is by symptoms. Aren't they supposed to start one on antibiotics immediately, upon Lyme symptoms/bulls rash/fact of tick bite being there, without blood tests? Lyme takes quite a while for antibodies to show up in the blood. I'll be doing long camping in possible Lyme area this summer, will make sure to have 2-week doxycycline supply on hand. The best precaution is to not get bitten, really. If you do find a tick, any tick, embedded, an immediate start of of 30 days of doxy is my routine. Rash or no rash.. doesn't matter. There are also many diseases that ticks carry that doxy will not help with so be warned. Beware the significant effects of sunlight toxicity on your skin when taking doxy past a week or so. Sunscreen does nothing. 30 days - isn't 14-21 enough? Regarding other infections...aside from very rare ones - doxycycline is supposed to work against Anaplasmosis. Babesiosis usually requires either no treatment, my understanding, or clindamycin. What else is there that isn't a freak occurence in Lyme areas? 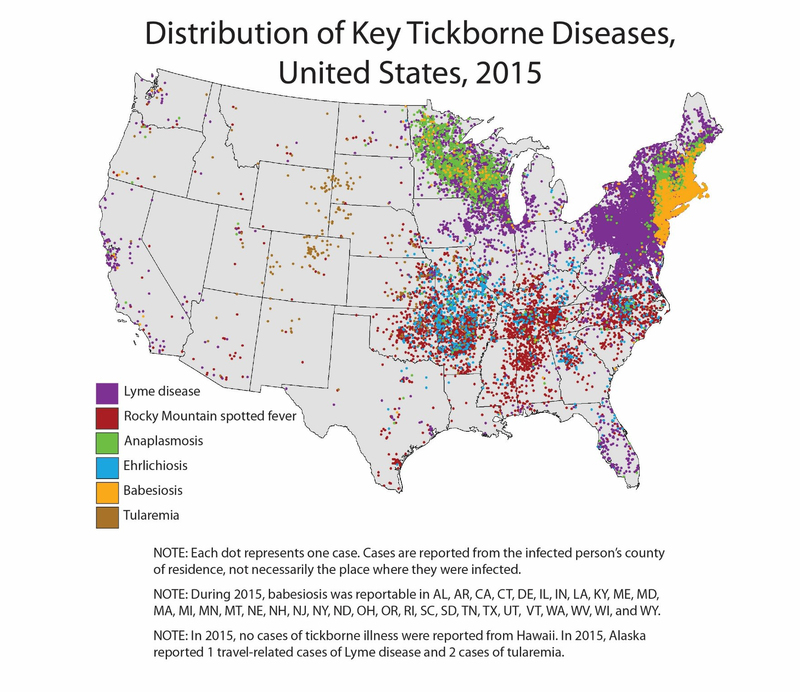 Erlichiosis and Rocky Mountain Spotted fever aren't co-endemic. 21 might be enough. 7 might also be enough. It might also be just enough to drive a few spirochetes into their alternate forms... to fester. The thing is once you've seen someone suffering with truly entrenched Lyme you'll question if 30 is enough. Don't believe a thing the CDC or IDSA says. Invest heavily in Permethrin sprays and impregnated clothing. That stuff works wonders. DEET for exposed skin re-applied liberally. I can't use Permethrin or DEET...can't use synthetic pesticides and wouldn't want anyway. "truly entrenched Lyme" I guess requires one not to take antibiotics early on...then, months of antibiotics might be needed, but I'm talking only about initial stage of possible Lyme shortly after a bite here. Need to buy more antibiotics to carry traveling. "Who had you take a big blood test?" I did the blood and hair sample test and it showed a lot of nickel and aluminum. I went to a chiropractor for that. She was part of a program where they do a more comprehensive testing for 1/3 the price, the Science Based Nutrition program. Then I had the hair done by someone else, they are in this thread already. "The best precaution is to not get bitten, really. If you do find a tick, any tick, embedded, an immediate start of of 30 days of doxy is my routine. Rash or no rash.. doesn't matter. There are also many diseases that ticks carry that doxy will not help with so be warned." If I find a tick on myself tomorrow morning I would do zero, zilch, zip, nil, nought, nothing. Well maybe not nothing altogether, I suppose I would need to remove the tick. Frank Tkac says he gets bit all the time, he doesn't care either. Seriously though, when you get to the point where I'm at you just don't care anymore about ticks. That's not to say that I would not take serious precautions. A second tick would present new challenges. But I suspect at this point I am ready for anything and in the near future I think my immune system will be even stronger. And if my immune system was weak there is stuff out there stronger then what I take now. Perhaps there is a purpose in Lyme, in the long run I know it will only help me. If it was not for Lyme I would have never found all the weaknesses in my immune system now, and that would have been worse.